Several weeks ago, Mr. Crumbs came home late from a surfing session with two of his friends. He would have been home in time for dinner, but unfortunately, someone broke into his friend’s truck and stole wallets, credit cards, cell phones and even clothes! The three of them were at the beach for well over three hours PAST the time they planned to come home. Staying at the scene to call the police and file a report. Since our house is the closest to the beach they were at, they came here first. As the boys unloaded their gear from the truck and changed into dry clothes, everyone gradually made their way to our dining room table. A handful of minutes turned into a half hour, and when the commotion and re-telling the burglary event was over, the realization of hunger set in. Mr. Crumbs asked if we had any cheese and crackers. Yes, we have cheese. No, we don’t have crackers. A slightly bummed look came across his face, and I knew that the simplicity of cheese and crackers could have turned around this not-so-good-day and allow it at least end on a tasty note. Instead, I made a tray of cut vegetables and homemade ranch dressing. Although satisfying for the moment, the crunch of celery is just not the same as the crunch of a cracker. Ah, the forbidden cracker. A snack item that rarely sees the inside of our kitchen pantry thanks to the incredibly long list of ingredients on the box, or the incredibly large price tag on the organic box with a slightly shorter list. A lose/lose situation in either case that has left us alone in the dark when it comes to a starchy, solid crunch of a cracker to accompany our cheeses. Did you know that you can make a batch of homemade crackers in under 20 minutes? I didn’t. Not until I tried to find a homemade cracker recipe so that I could at least see if making a batch on a whim was feasible. Not that I want a replay of that event on the beach, but last-minute situations like this come up in life often. These are the times it would help to have a simple homemade cracker recipe on hand. Allow me to share my discovery. The simple combination of flour, salt and water is all it takes to make a delicious, crunchy cracker. A few minutes worth of kneading plus another 12-15 to bake and you have a whole grain, healthy snack – that’s a cracker no less – ready in just 20 minutes. Using your hands, combine flour and ⅓ cup of water in a medium bowl. Mix well until all the flour is wet. The dough needs to be stiff, but add additional water 1 Tbsp at a time if the dough is too stiff. Using a rolling pin, roll the dough out onto the back of a lightly floured 10x15 metal cookie sheet. Roll the dough to each edge and corner of the cookie sheet, rotating and flipping as needed to prevent sticking. Roll the dough as thin as possible for a crunchy cracker, or leave it slightly thicker for a chewier cracker. Score the dough into desired sized using a pizza cutter or a knife. Prick holes onto each cracker using a fork. Bake in a preheated oven at 350 F for 10-15 minutes, or until the crackers are medium brown and begin to pull up at the edges. Remove from the oven. Eat immediately, or the next day. Store in a sealed container. I make this recipe with freshly ground flour. You may need to adjust your measurements on flour and water. But, only go up or down by a teaspoon at a time. Use just enough water so the flour is wet but the dough is stiff. This will allow you to roll it out easily, instead of pouring the dough onto the back. When in doubt, use less water. Remember that you can always add more, and if you do, add just a teaspoon at a time. These homemade crackers are best straight out of the oven, or the next day. The crackers may lose their crunch a couple hours after they finish cooking. If this happens, just let the crackers sit for a day longer in an airtight container. I don’t know for sure, but I think it’s the excess moisture coming to the surface of the cracker. Once they sit for a while, the crunch returns. No matter when you eat them though, the flavor is still delicious. Do you keep crackers in your kitchen? Have you found a brand that you like, or do you make your own? This post is sponsored by Jovial Foods. As always, I would never recommend anything on Crumbs that I wouldn’t recommend to a close friend or neighbor, and all opinions here are my own. Are the crackers as tasty as they look? I wish I could try one of yours! 🙂 Right now we’re only allowed crackers on our treat days (Sat. or Sun). I’d love to enjoy them on some of those evenings in-between with cheese or avacado, etc. But I don’t want to make a whole batch and be disappointed. ooh, go ahead an try them. I made some for lunch today, easy breezy. enough to cover the bottom of the pan was not too much. left over for tomorrow. HI! I am loving your website. Could I use ground oat flour instead of whole wheat flour? Thanks! I haven’t tried it Olivia, but it’s certainly worth a shot! I would add the liquid slowly since oats tend to absorb quickly, then roll extra thin to avoid the “oatmeally” issue. Good luck, and please let us know how they turn out! I make a recipe very similar to this that uses apple juice as the liquid which gives them a slight sweetness and when topped with a bit of salt is similar in flavor to the store brand Wheat Thins. Ooh – that sounds good! I’ll give that slight change a try the next batch I made. Thanks for the suggestion Rachel! I found crackers at Trader Joe’s that are like ritz crackers but without all the yucky stuff in them. The only drawback is that they aren’t whole wheat but they are only a snack so I make an exception. They are only $2.29 for a 12 ounce box so that puts them in the affordable range for me. I am going to try making homemade ones but just never seem to find the time. Great idea! I love recipes with few ingredients. I will give it a try this week. Um, since I am new to doughs, do you happen to have a picture of how the dough should look like before spreading it? Or maybe can you please find one ? Last time I tried to make crackers it went terribly wrong, with a really sticky dough and a chewy final texture. Hi there! Unfortunately I don’t, but you want it to be THIN. By the time you roll it out, you’ll have some pieces that are nearly see-through. This dough makes JUST ENOUGH to cover to the edges of the pan – literally. Chewy crackers means the dough was too thick, so just keep rolling!! Great crackers. Quick and easy to make. I put a tea towel under my upside down cookie sheet to help hold it in place while I rolled out the dough. This recipe makes enough crackers, I got 44 crackers. They were dense and great for dipping in spicy hummus. Thanks so much. These crackers are great! Thanks for my first easy-to-make cracker recipe. 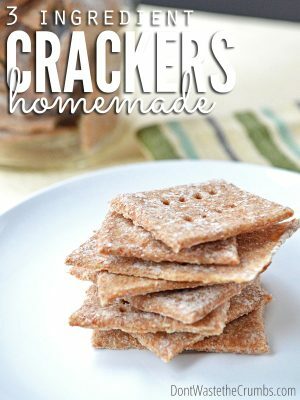 Crackers should be simple, but I’ve tried other recipes with no success, or they just didn’t taste good. I also made one batch with about a TBS of brown (unhulled) sesame seeds. Those were awesome, too. They both tasted good dipped in a homemade vegan sunflower seed-dill dip. Thanks again! Sorry, I forgot to rate! I was wondering if I could substitute spelt flour with buckwheat flour? Sure Juliana – that should work! Naila, neither corn flour or chickpea flour contain gluten, which means the crackers won’t rise. The good news though is that crackers don’t need to rise to taste good! I haven’t tried this recipe with non-gluten flours so I can’t guarantee the turn-out, but if you try it, please let us know how it goes! I made these tonight with a quarter cup of grated parmesan added and they were super good! The speed and easiness was very much appreciated! These may be showing up again soon! Have you ever tried freezing these? If so, how do you thaw them for best results? Do you know how long these will keep in an airtight container? Thanks! Perfect! I’m going to try making them now. Was recently diagnosed with type 2 diabetes and found most of the wholewheat crackers I can buy too salty or had hidden sugars, so I really wanted to try making my own! Thank you so much! I’d certainly like to try making these crackers, since I’m one of those girlies who absolutely loooooooves crackers! 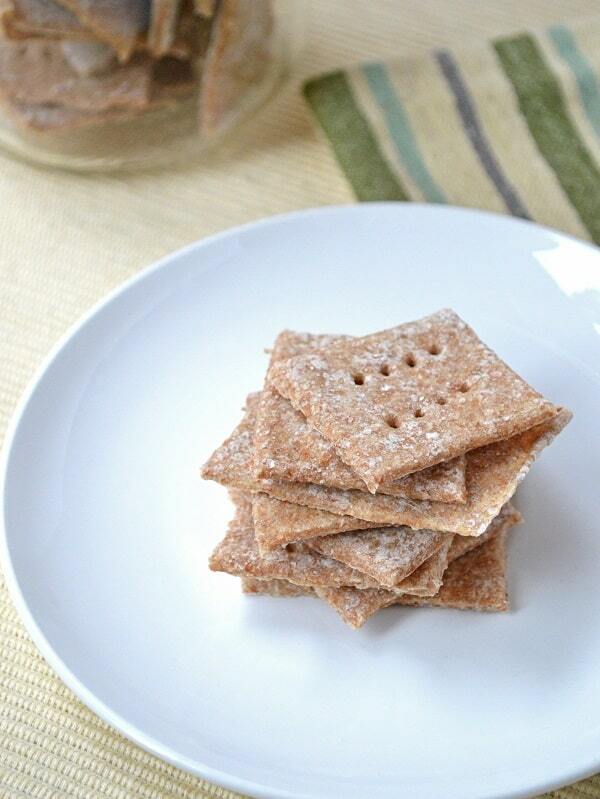 I want to try making a batch similar to Ritz crackers, or even Triscuits or those Keebler butter crackers. Fun shapes would be cool to make, like Kangaroo crackers. Would cookie cutters work for making shapes? When I buy store bought crackers, I usually put them in a gallon-sized baggy, the Hefty kind, and freeze them. They maintain their crunch a lot longer! I used to put them just in my kitchen cupboard, but found they lose their crunch and taste stale after seven days! Hey Annabelle! Yes, cookie cutters will work! Would I cut them into shapes before putting them in the oven? I wonder if the dough has to rise before you prepare it. Some doughs, like the one I make for Canadian Beavertails, have to sit and rise for up to 40 minutes in a warm environment. 3 ingredients? I’m in. Can’t wait.. making them tonight to go with chicken chili. I will write back..thank you.I gave it 5 stars because I know they will be great it’s my starter recipe now I can have fun and tweek the recipe for what ever I am making. I made these with my twins today. A few things I learned. Do Not forget to poke the holes in them, and when you think you have rolled them thin enough, roll them out again. (I rolled mine out on the counter.) I substituted the salt for my favorite homemade house seasoning mix and baked them 12 minutes on an Air Bake sheet. The second sheetful came out beautiful, crispy, and flavorful. This recipe will go in my files. Thank you. Great tips Christy – thanks so much for sharing!